No one is really giving the Reds a chance in the National League Division Series. Their own poor track record at Citizens Bank Park (losing the last 6 games there, dropping 10 of 12 there over the past 3 seasons) combined with the trio of starting pitchers and the potent lineup they'll have to face, plenty of baseball analysts and observers virtually have placed the Phillies into the League Championship Series already. Cincinnati manager Dusty Baker will send right-hander Edinson Volquez to the mound, hoping to prove the doubters wrong. Philadelphia will counter with NL Cy Young Award contender Roy Halladay, who will be achieving a life-long goal by making his first career postseason appearance. Halladay, widely considered an elite pitcher in Major League Baseball, has watched the playoffs on television for his entire career, until this year. Halladay wanted to pitch for a title contender so badly that he passed up the opportunity to test free agency, and instead signed a contract extension with the Phillies following a trade from Toronto last off-season. In his time with the Phillies, Halladay has proven to be the ace that Phillies general manager Ruben Amaro Jr. sought out last year. 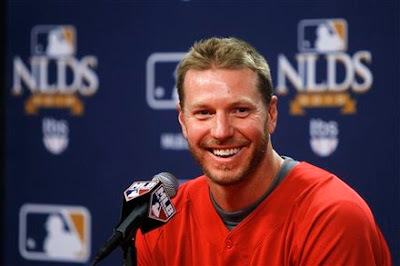 Halladay finished in top 3 in each of the National League pitching triple crown categories (wins, strike outs & ERA), threw a perfect game in May and his 9 complete games are more than any other team in the National League. He hopes to continue his success well into October. The Phillies, owners of the Major Leagues' best record at 97-65, have home field advantage in the best-of-5 series that begins Wednesday evening at Citizens Bank Park. Read ahead for details on the pitching match ups and plenty more information on this series. Game 1- Wednesday, 5:07 PM in Philadelphia. Edinson Volquez (4-3, 4.31 ERA) vs. Roy Halladay (21-10, 2.44 ERA). In 2 career games against the Phillies, Volquez has posted a 2-0 record and a 0.79 ERA. In 5 road starts this season, Volquez's record was 1-1 and his ERA was 6.08. Jimmy Rollins, Chase Utley, Ryan Howard and Shane Victorino are a combined 3-for-22 (.136 avg) in their careers against Volquez. In 18 starts at Citizens Bank Park this year, Halladay has a 12-5 record with a 2.21 ERA and a .242 batting average against. In his last outing against the Reds in July, Halladay threw 9 shut out innings. Ramon Hernandez is 13-for-37 (.351 avg) in his career against Halladay. Game 2- Friday, 6:07 PM in Philadelphia. Bronson Arroyo (17-10, 3.88 ERA) vs. Roy Oswalt (13-13, ). Arroyo has posted a 1-5 record with a 5.54 ERA in 8 career regular season games against Philadelphia. In 18 road starts this year, Arroyo has a 10-5 record with a 3.76 ERA. In his last 9 starts, Arroyo went 5-3 with a 3.72 ERA. Oswalt has really performed tremendously in 10 career starts at CBP, going 9-0 with a 2.10 ERA. In his career against the Reds, Oswalt has a 23-3 record with a 2.81 ERA. In 13 games as a Phillie, Oswalt is 7-1 with a 1.74 ERA and a 0.90 WHIP. Joey Votto is 10-for-30 (.333 avg) with 2 doubles and 2 HR against Oswalt in his career. In 8 career postseason games, Oswalt is 4-0 with a 3.66 ERA. Game 3- Sunday, 7:07 PM in Cincinnati. Cole Hamels (12-11, 3.06 ERA) vs. Johnny Cueto (12-7, 3.64 ERA). In 7 career starts against the Reds, Hamels has a 6-0 record with a 1.07 ERA. In 18 home starts this season, Hamels posted a 7-6 record with a 3.14 ERA and a .243 batting average against. Hamels posted a 2.23 ERA in 15 starts after the All-star break this season. In 10 career postseason starts, Hamels has a 5-3 record and a 3.86 ERA. In 4 career starts against Philadelphia, Cueto is 1-2 with a 5.96 ERA. In his last 9 regular season start, Cueto posted a 1-5 record with a 4.71 ERA. Shane Victorino is 5-for-10 (.500 avg) with 2 HR in his career against Cueto. Game 4- Monday, 5:07 PM in Cincinnati. Game 5- Wednesday the 13th, 6:07 PM in Philadelphia. Ryan Howard is a career .271 hitter with 7 HR and 21 RBI in 32 postseason games played. In 7 games against the Reds this season, Jayson Werth batted .375. Werth also posted a .320 average in 82 home games this season. Since the All-star break, Brad Lidge had 21 saves, a 2.10 ERA and held opponents to a .162 batting average. In 32 career postseason games, Brad Lidge has a 2-4 record with 16 saves and a 2.52 ERA. Joey Votto batted .349 on the road this season. Votto is a .267 hitter in 12 career games at Citizens Bank Park. Francisco Cordero has blown 2 saves in 8 chances against the Phillies in his career. In 33 games on the road this season, Cordero saved 18 games in 23 chances and posted a 4.60 ERA. In 32 career postseason games, Scott Rolen is a .228 with 5 HR and 11 RBI. Rolen made the All-star team this season with 17 HR. Since the All-star break, Rolen has hit just 3 homers since then.